GCE developed a travel demand forecasting model for the rapidly growing City of Pearland, Texas. GCE incorporated regional population and employment forecasts from the Houston-Galveston Area Council (HGAC) to assure that the City model was appropriately calibrated within the regional forecasts for the Houston area. 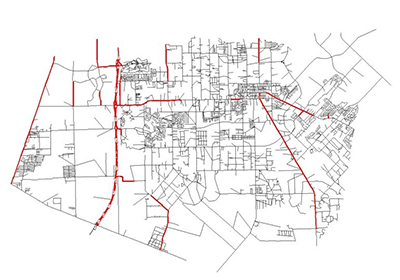 The model platform used, TransCAD, which is consistent with the TxDOT statewide model, has the capability to reflect changes to the roadway network as well as changes in growth patterns. Scenarios were run to predict capacity deficiencies for the long-term (Year 2025) as well as a short-term test (Year 2010). GCE also worked with Brazoria County, TxDOT, and the City of Pearland staff and created a list of highway network improvement projects likely to be completed. These projects were then coded into the highway network. GCE staff also worked with the City planning and engineering staff to use the model as a tool in prioritizing capital improvement projects. The results of the model development were summarized in a report and submitted to City of Pearland. The report also provided instructions on how to install and run the model as well as provided recommendations on continued model refinements and maintenance.